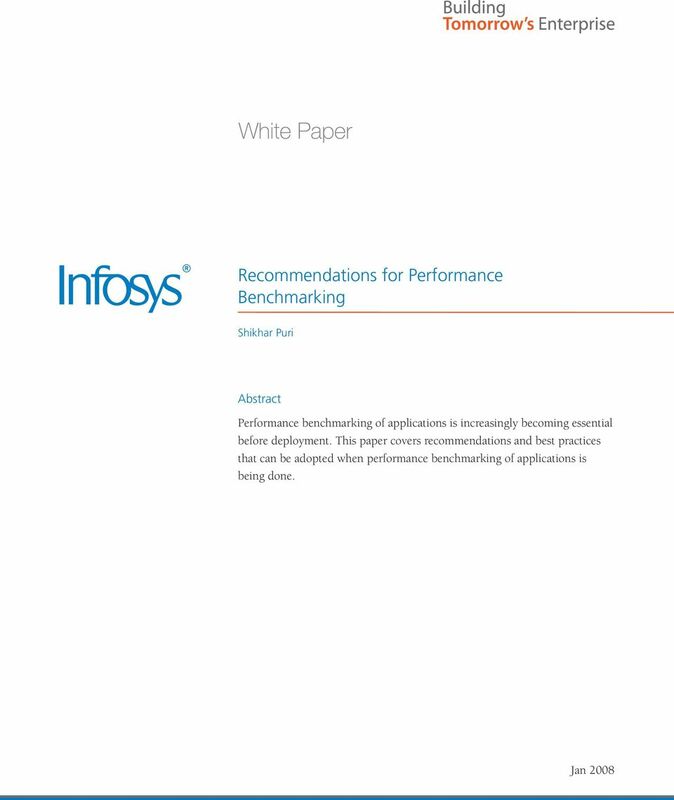 Download "Recommendations for Performance Benchmarking"
6 Transaction response time: Generally the transaction response times are presented as 90th percentile transaction response time. This means that 90% of the total transaction response time occurrences are below the figure marked as 90 th percentile figure for the candidate transaction. This is better than presenting the average response time figure, which averages out the peaks and variations in response times. Sometimes even 90 th percentile figure does not portray the correct picture and further analysis should be carried out before presenting the results summary. For example, if a transaction that has very low iterations (2 per test duration) and if one of the iterations happened during the initial stage or when the system was not performing well, the 90th percentile response time will be the response time for the mentioned iteration and that will be very high. In this scenario, we can ignore the mentioned iteration with proper justification and consider the response time of the 2 nd iteration. Similarly if the frequency of transactions is high and 90th percentile response time is quite above the expected response time, the difference between 85 th percentile and 90 th percentile response time should also be checked. If the difference is not much the transaction has performance issues, but if the difference is very high the iteration occurrences should be checked and the reasons should be examined. It is observed that usually the transaction is performing well but there are apparent issues in the system when the iterations for the candidate transactions are performed. Conclusion Performance benchmarking, pre-deployment, is an increasingly prevalent practice. 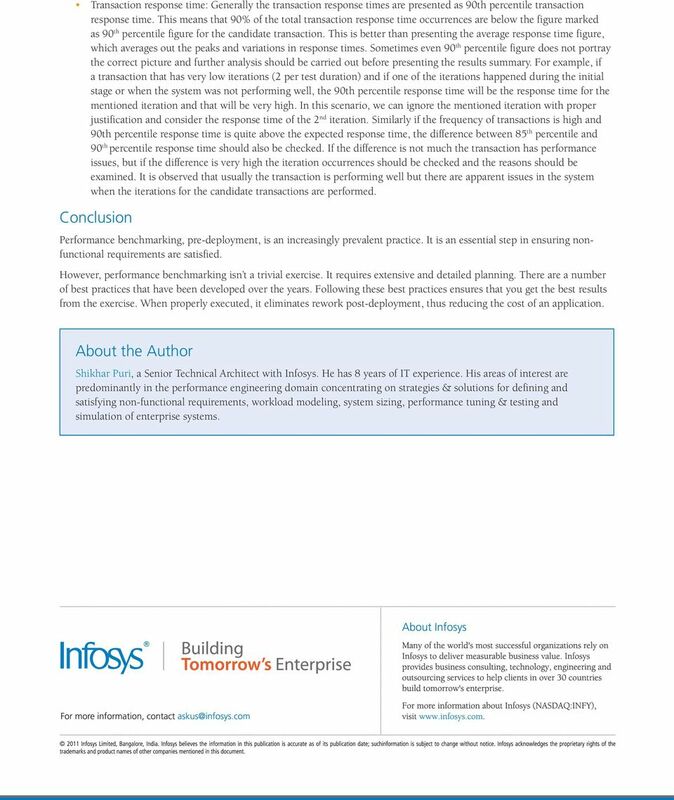 It is an essential step in ensuring nonfunctional requirements are satisfied. 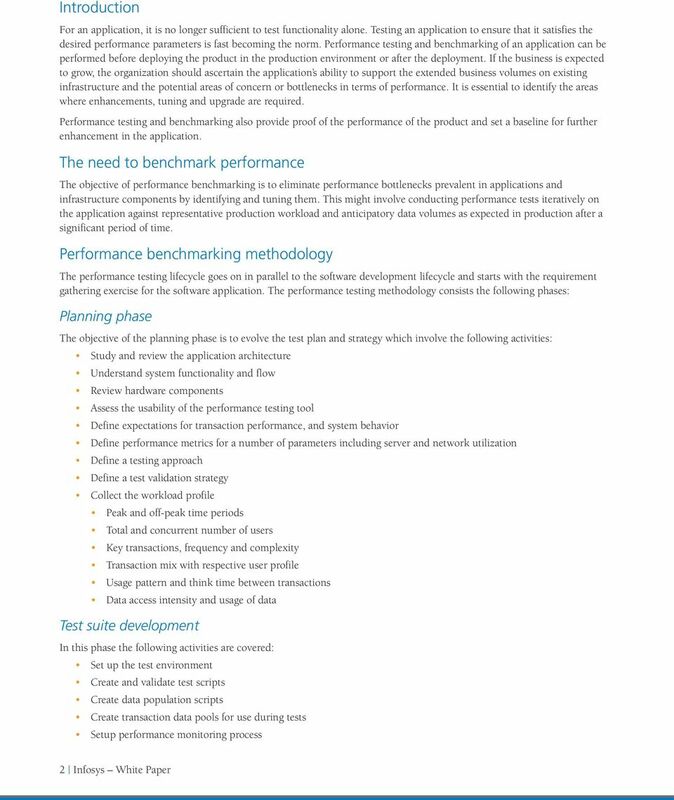 However, performance benchmarking isn t a trivial exercise. It requires extensive and detailed planning. There are a number of best practices that have been developed over the years. Following these best practices ensures that you get the best results from the exercise. When properly executed, it eliminates rework post-deployment, thus reducing the cost of an application. About the Author Shikhar Puri, a Senior Technical Architect with Infosys. He has 8 years of IT experience. His areas of interest are predominantly in the performance engineering domain concentrating on strategies & solutions for defining and satisfying non-functional requirements, workload modeling, system sizing, performance tuning & testing and simulation of enterprise systems. 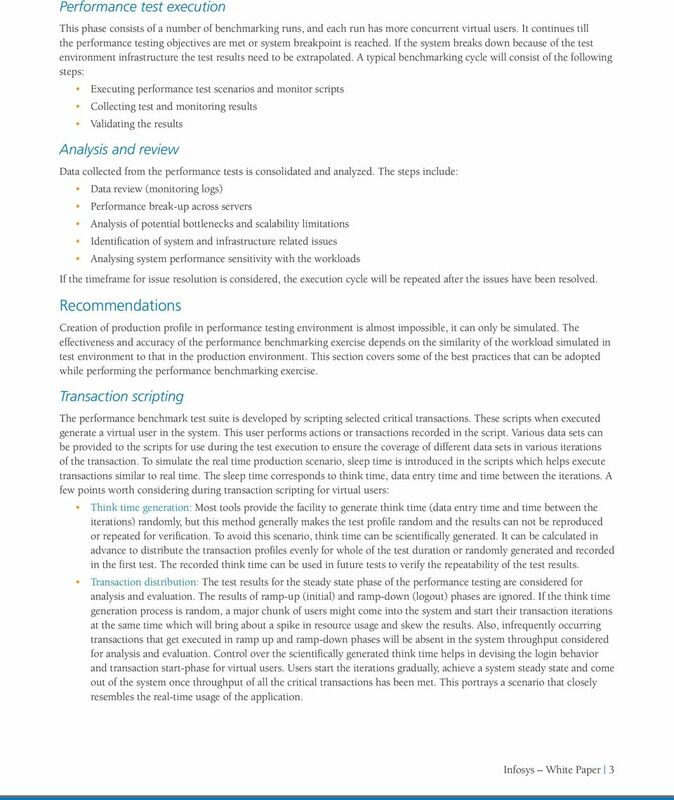 EQUELLA Whitepaper Performance Testing Carl Hoffmann Senior Technical Consultant Contents 1 EQUELLA Performance Testing 3 1.1 Introduction 3 1.2 Overview of performance testing 3 2 Why do performance testing? 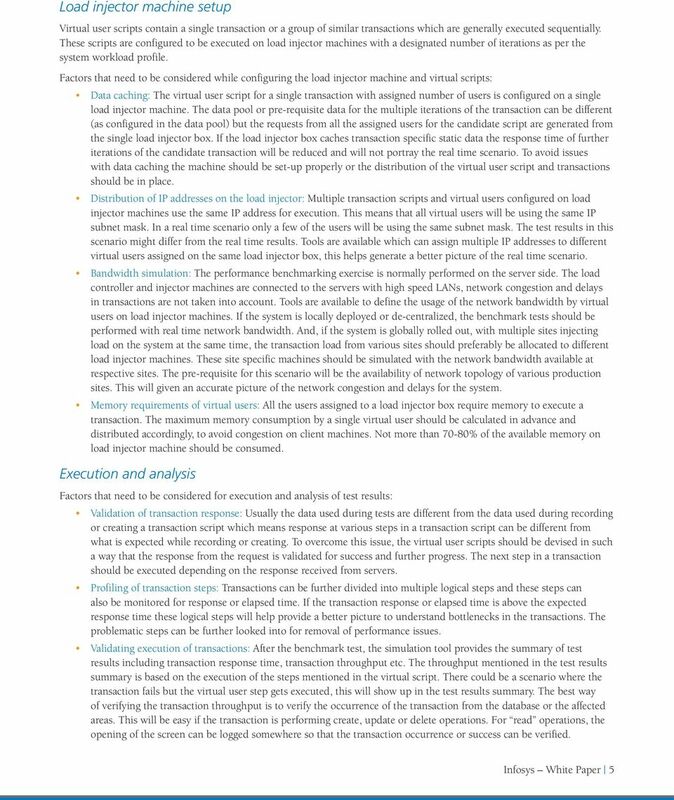 White paper: Unlocking the potential of load testing to maximise ROI and reduce risk. 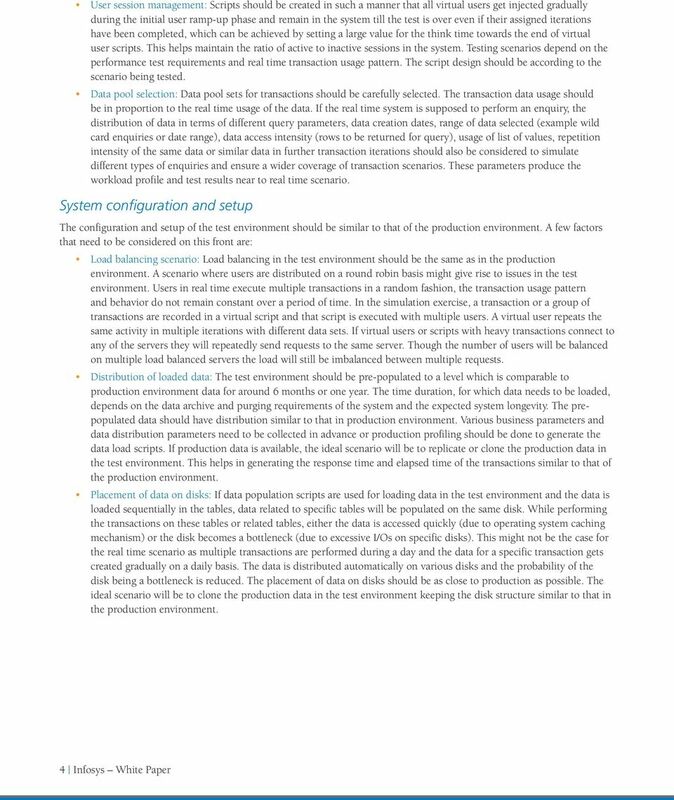 There are a number of factors that increase the risk of performance problems in complex computer and software systems, such as e-commerce systems. Performance Test Report For OpenCRM. Submitted By: Softsmith Infotech.